I always love decorating our home for fall. Maybe it is because we have orange siding so it just fits so well with the season and our surroundings. Plus I live in a heavy agriculture region so it so easy to get our hands on pumpkins, gourds, unique squash, and of course apples and pears. This year I decided to get a bit more vintage with my fall decorating ideas. I was recently asked to give the New Martha Stewart Vintage Decor Paint a try and I must say I’m in love! The paint couldn’t have been a better fit for my country decor pieces that needed a little TLC. I was recently asked to give the New Martha Stewart Vintage Decor Paint a try and I must say I’m in love! The paint couldn’t have been a better fit for these country decor pieces that needed a little TLC. I found this old basin at my Aunt’s house that was destined for the dump. The bottom is quite rusted so not good for much other than a decoration. This paint can be used on a variety of surfaces. I was eager to try it on metal, but can be used on wood, glass, and fabric. The best part, it needs NO preparation! Wipe the surface or your object clean. Apply the color paint you would like to show through your distressing first with the Martha Stewart Crafts® Vintage Decor Paint Brush. Allow to dry for 1-2 hours. I used the colors Red Wagon, and Linen for this project. Apply your second color directly over the first. Allow to dry. Use sandpaper distress your project to the desired effect. I went quite rough in some areas to show through a bit of the metal. Again wipe the surface clean to rid your piece of sanding dust. Apply Martha Stewart Crafts® Vintage Decor Wax with the Vintage Decor Paint Brush or a lint free cloth. I think the wax is my favourite part of the entire project. I LOVE the velvet finish it gives the project. I have used it on countless projects! Follow step 1 and 2 from above. 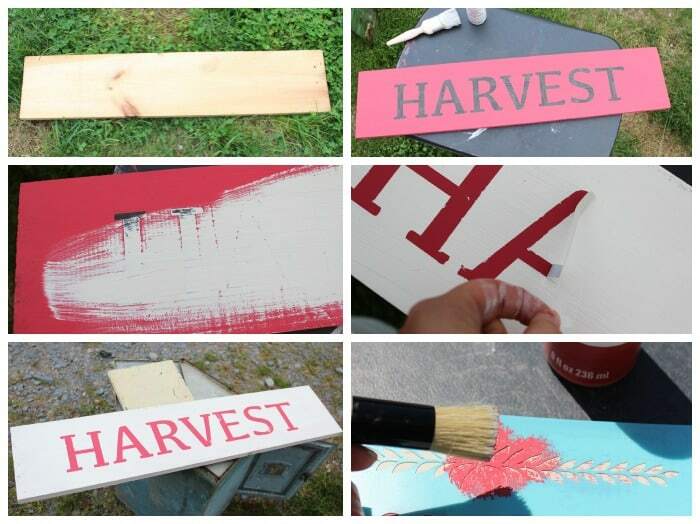 Apply vinyl letters to your project after the first coat of paint dries. Paint the second color of Vintage Decor Paint directly over the vinyl letters. Distress with sandpaper. I actually used a palm sander for this sign as I wanted the edges to reveal the wood. Apply a Martha Stewart Crafts® Vintage Decor Stencils with a small stencil brush. 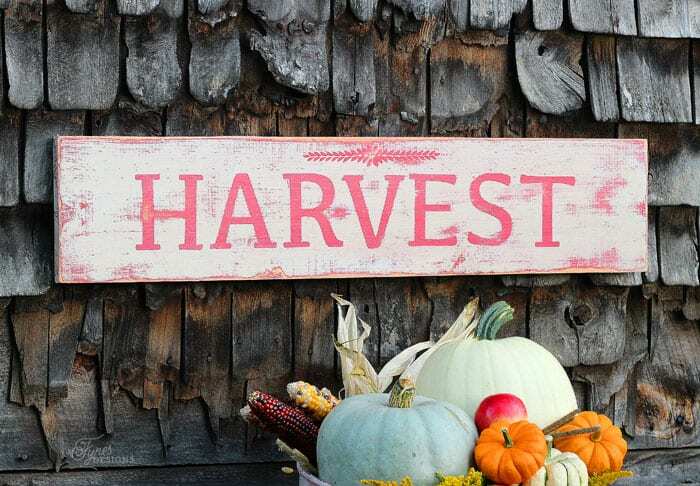 I love how the Harvest sign turned out. A perfect match for fall decorating. Vintage Decor Paint is available in a charming palette of 22 traditional and stylish colors. So there is a color scheme to please everyone’s decor taste. Thanks for stopping by today, Happy Fall! You can see my disclosure here. As usual all opinions are 100% my own. Love LOVE love it Virginia!! Everything is sooo pretty!! And your detailed description is fabulous! This is gorgeous V! I love love how you painted the basin – it looks fantastic overflowing with all the squash! OMG! You will have to come and help me decorate when we move to our new home. LOVE all these projects. Thanks for sharing!! So pretty! You really transformed the bucket and made it look like something old and wonderful. 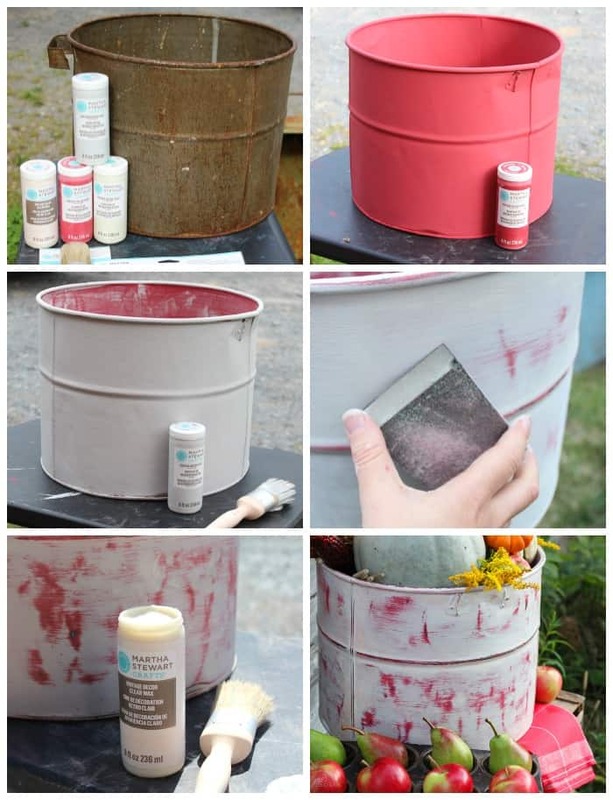 I love how your bucket turned out. I have one of those with the bottoms almost gone. I think I will paint it. Your display is so lovely. Great for fall. Thanks Beverly, The bottom in this one is quite holy! It was going to be trash otherwise! I love this time of year, fall decorating is so much fun. How fortunate you are to have gourds and pumpkins so readily available! I love how your project turned out, those paints look great to use. This is gorgeous!! Love the color mix! 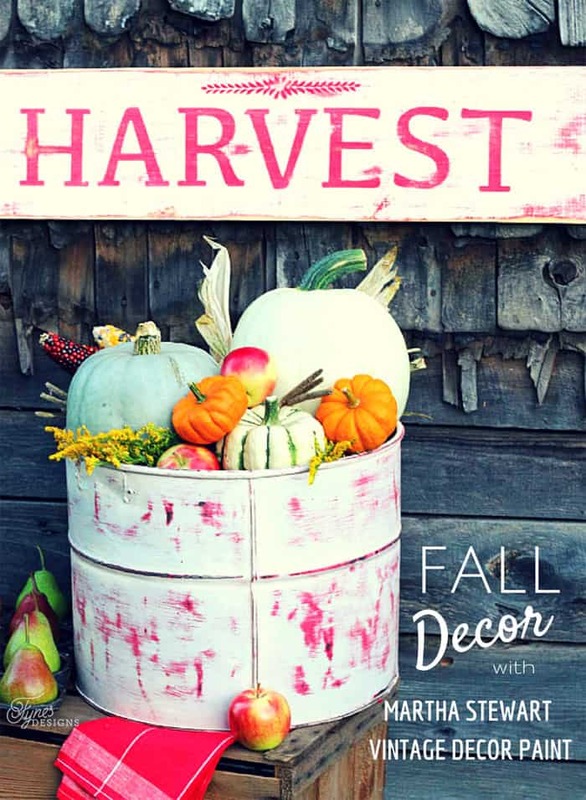 I love Fall and your decorating ideas are gorgeous. Thanks for sharing at the Thursday Favorite Things Blog Hop. Love how beautiful this turned out! 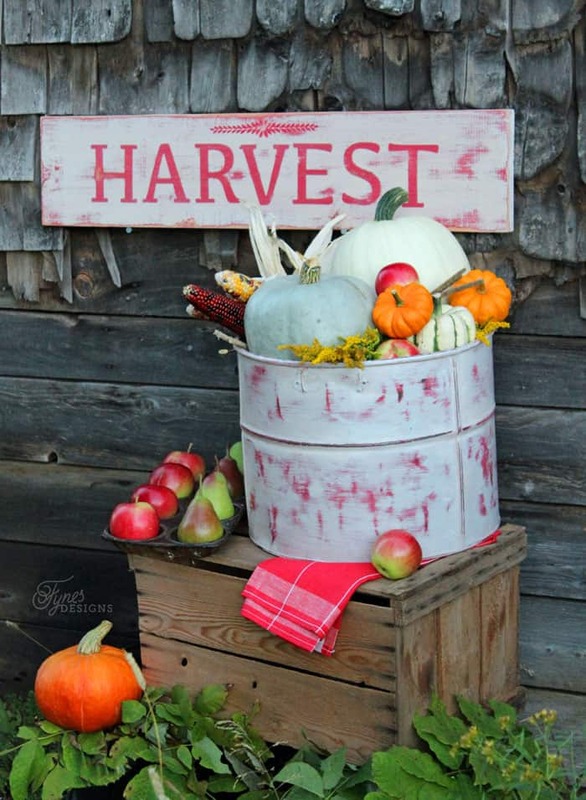 Perfect for a fall photo shoot to commemorate the fall season…. I just love it and will pin to my DIY board right now. I really love the colors that you chose to use. Really cute! This is such an amazing idea! Thanks for sharing it. I’m Anita visiting from Think and Make Thursday Link Party. What a great project, so glad you were able to save the basin from its demise, your project turned out great and a perfect addition to my Friday Features Linky Party this week.